You will enjoy any camping trip with this Flying Cloud 25FB Twin. With sleeping space for six people there is room for your whole family. You will enjoy the convenience of the split bathroom with a shower along one side of the trailer and a private toilet area with a sink across the hall. 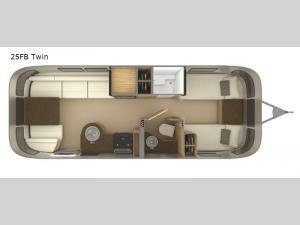 Sleeping space can be found at the two twin beds, the rear dinette, and the sofa. What are you waiting for? Come choose this Flying Cloud model and begin making plenty of camping memories with your family!